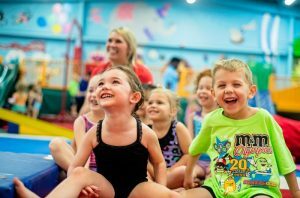 At Oklahoma Gold Gymnastics we call 4-year-old little gymnasts Munchkins. This program continues to focus on motor development and coordination, strength, spatial awareness and body control while adding more opportunities for early gymnastics fundamentals. 4-year-olds are beginning to understand multi-step instructions and are able to follow directions independently. All of this adds up to increased skill development opportunities while still utilizing our creative Tumbletown gym. Munchkins will climb on rock and rope walls, ride Ziplines, triple swings and bungee jumpers, and learn to execute skills on trampolines, trapezes, beams and bars. There will be six Munchkins per coach. The class rotates to a new station every 12 minutes. They will be building and growing their muscles every class, but that’s not all we care about at OKG. Your child will also build their confidence and self-esteem, which are our most important building blocks for this age group. Tuition below is for 1 class per week for 9 weeks. There is a 10% discount for adding additional classes. You can sign up for class at any time and we will prorate tuition.